Liquids (such as water) that wet glass climb upward on the surfaces of their containers to form a concave meniscus. This occurs when adhesive solid-liquid intermolecular forces are stronger than liquid forces. Such liquids will rise in a narrow capillary tube until a balance is established between the effects of surface tension and gravity. The capillary rise increases sharply as the tube is made narrower. 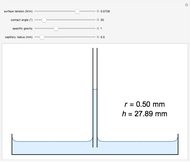 For example, water in a glass capillary of radius 0.1 mm will rise by about 140 mm. 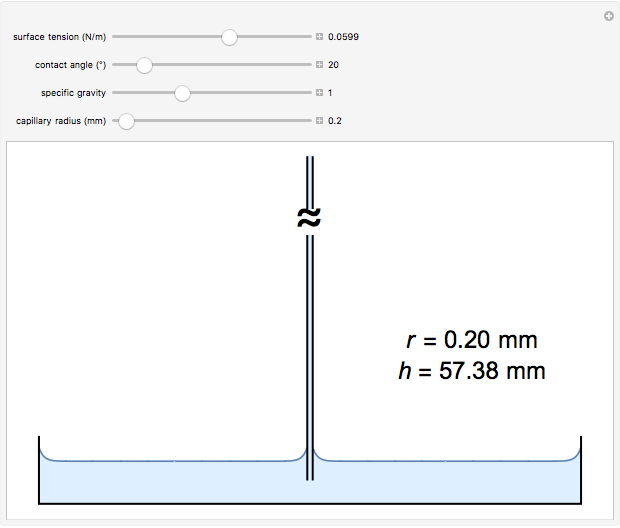 The capillary rise is given by , where is the solid-liquid surface tension in N/m, is the contact angle for the meniscus (measured upward from the vertical wall), is the density of the liquid, is the gravitational acceleration (9.81 m/s ), and is the radius of the capillary. 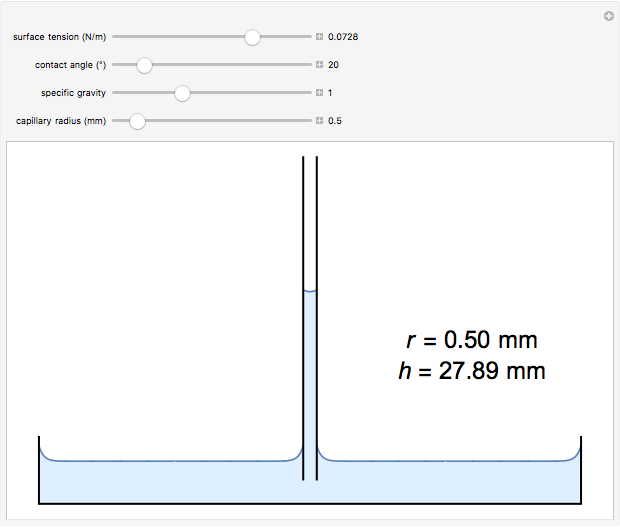 In this Demonstration, is expressed as a specific gravity ( corresponding to 1000 kg/m ), while and are given in mm. The default values are those for water in glass at 20°C. Capillary action provides a mechanism for carrying nutrients upward from the roots of plants. Towels soak up liquids because of capillary action by their fibers. Likewise, a candle depends on the capillary rise of melted wax into the wick. Reference: G. K. Batchelor, An Introduction to Fluid Dynamics, New York: Cambridge University Press, 2000. S. M. Blinder "Capillary Action"